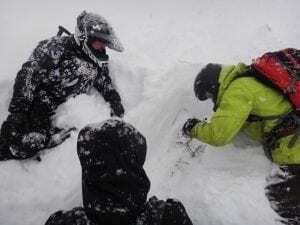 As more people head into the backcountry to recreate in the snow the demand and need for avalanche awareness classes and hands-on field avalanche training has increased. Thanks to the Alaska Community Foundation and a Strengthening Organization Grant award, AAIC is moving closer to meeting that demand. We are proud to announce the award of this grant to increase the number of trained, certified instructors to facilitate expanded public outreach, respond to more search and rescue requests, and increase training capacity. The goal of this project is to train staff as certified instructors under the American Institute of Avalanche Research and Education (AIARE) program, recognized by the American Avalanche Association (AAA), in order to increase our capacity to serve the needs of thousands of Alaskans and visitors to our state. Qualified instructor candidates, having met the rigorous list of requirements, will begin their training at the first Instructor Training course December 9-13, 2016. Candidates that complete this course will shadow qualified staff for the remainder of the 2016-2017 season to practice their new skills in the field. With a certified, trained leadership pool to draw from, the AAIC will have the ability to better serve many more Alaskans with snow safety education and forecasting services. Developing and utilizing local Alaskans qualified to teach will strengthen the AAIC with the ability to offer more training opportunities at a considerable cost savings making it more accessible to more Alaskans, especially disadvantaged and underserved residents. Grant awards from organizations like the Alaska Community Foundation are an investment in public safety for Alaska residents and visitors alike. This financial support helps sustain a long-term program that will increase workforce prospects in Alaska and expanded educational opportunities for all Alaskans.